My name is Alex. Im 23 and I currently work and study in Dundee. My hobbies include sword fighting and being a complete politics nerd. I never really considered myself a sporty guy, but like a lot of hyperactive ADHD kids, I naturally fell into a lot of different sports just as something to do. I love sports that focus on team work and healthy competition. I enjoy pushing myself as far as I can go and trying to be a better version of yourself. When I came out as a Trans guy at the end of my second year, I realised just quite how much I (and a lot of trans people I know) have to risk and give up in order to live our true lives. For me my transition and sport are linked. My gym was my escape from the rest of the world. I could reclaim my bodily autonomy I felt like I lost when I realised, I was trans, instead using weights to reshape my masculinity in a way that suited me. I started a gym programme at the University of Dundee’s Institute of Sport and Exercise to try and encourage more trans people to use the gym facilities. 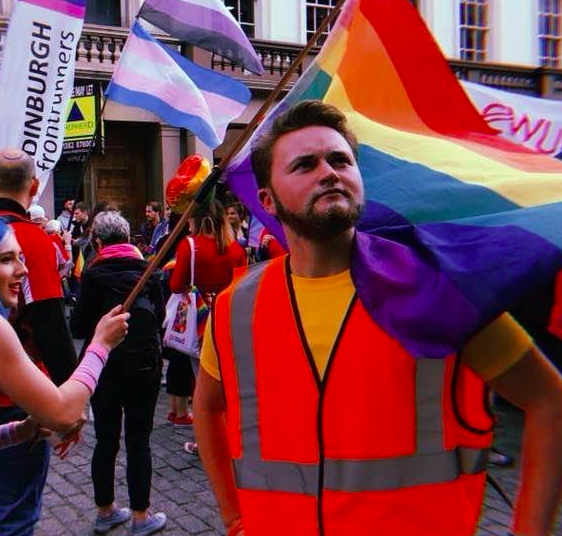 I worked with the Scottish Trans Alliance to run LGBT+ awareness workshops that I now run for groups across Dundee. i Even became the LGBT+ representative on the University Student Representative Council. I’m really passionate about breaking down barriers that trans people face on society, specifically around healthcare and sports. LEAP has been essential in helping me reach others and has provided me with so many opportunities, advice and guidance that hopefully make me a better activist. The best example of this was being asked to give a talk last year at the “Sport Changes Lives” seminar to a delegation from Sport Scotland. At 21 I was a politics graduate without much of an idea about what to do with my life. But while in school and university, volunteering has opened so many doors for me that I had either never considered or would never have had an opportunity to explore. Dundee is amazing, but its queer scene is a bit small. For me volunteering was the best way for me to be able to work in the sector I am passionate about and on projects that I have a real connection too. I first came across LEAP at a film screening they did at the University of Abertay in the run up to the Winter Olympics in Moscow. The story connected with me and when I was starting my project I knew were to go for support. LEAP have been an amazing opportunity for me to meet new people, gain skills and be part of projects that feel like they really make a difference. I can work 1 on 1 with my mates in gyms and help those in my immediate surroundings, but with LEAP and their support I can be part of something bigger. Like national campaigns that work towards improving the lives of fellow LGBT+ people. Started a “first of its kind” gym programme that is trying to identify the barriers trans people experience when trying to exercise more and gain access to gyms that they feel comfortable in. This is important to me as exercise was important in helping me through my transition. While transitioning I started being involved in a lot of awareness raising and teaching opportunities including; giving a talk at a medical conference in London around access to healthcare, speaking at a Stonewall conference about trans experience in the workplace. Even being invited back to the University of Dundee as a “Young Change Maker” for their festival of the future. I was also involved with the organisation of Dundee City’s first ever Pride. That managed to get over 5,000 people showing support for the LGBTI community. Was an absolutely amazing day. What next Further research into the barriers transgender people face to exercise and looking fir possible solutions. Really excited to be a Mentor for LEAPs new Youth Activism Academy.